WARNING: Spoilers for Glass, as well as Split (2016) and Unbreakable (2000), follow. I would recommend reading this after you've seen Glass, if you intend on seeing it. Which I wouldn't necessarily recommend doing at all, unless you need closure on the David Dunn/Elijah Price story. There was a moment during Split—about when the Beast (James McAvoy) is roaming the underground halls of the Philadelphia Zoo, choosing which of the teen girls he wants to murder next—when I thought to myself "it would be kind of cool if Bruce Willis showed up to save them." It was set in the same city as Unbreakable, after all, and had a similar real-world feel to it. Plus, it was directed by the same guy who made that film, a film about a seemingly ordinary man who discovered he had extraordinary powers—and discovered he had an obligation to use them to protect the people. M. Night Shyamalan did reintroduce David Dunn (Bruce Willis) to the world in Split, of course, but it came at the end of the picture, in a goosebumps-inducing coda. I left the theater giddy but torn, divided between thinking it a cheat and thinking it brilliant. I wound up leaning toward brilliant given my previous desire to see his poncho-enveloped form show up and do some damage to Split‘s villain. 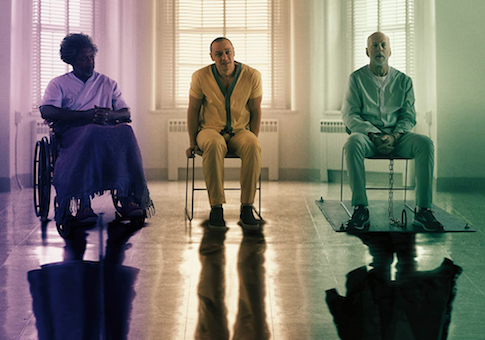 I mention all this at the beginning of my review of Glass, the third in a trilogy of films about superheroes and villains hiding amongst us, as a way of assuring you that I really, really wanted to like Glass. I consider Unbreakable a borderline masterpiece of pop art, all the more so because it practically set the stage for the cinematic universe we inhabit, the universe of universes, of MCUs and DCEUs, of capes and spandex and muscles and machines demonstrating our desire for the extraordinary to save us. Unbreakable was, in a very real way, a prelude to the age of comic book films we find ourselves in now. And there's good stuff in Glass, an idea at its core about the necessity of purpose for humans that resonates. Sadly, the film isn't quite tight enough to drive home its points. In that looseness we find a sin worse than sloppiness or authorial vanity: we find boredom. Glass picks up after the events of Split: The Horde (the collective name for McAvoy's split personalities) has taken another group of girls. Two other sets of victims have already been found. Dunn is patrolling the streets of Philadelphia, trying to find the killer: he can sense evil by touching those who have done it, and happens upon The Horde during one of his walks. Dunn saves the girls, but in the process he and The Horde are captured by the police, who are working with psychiatrist Dr. Ellie Staple (Sarah Paulson). She hopes to convince Dunn, The Horde, and Elijah Price (Samuel L. Jackson) that they are just men: strong, perhaps; overly intelligent, maybe; able to do impressive things, sure. But not super. Not unreal. Of this world. It is during their stint in the psychiatric ward that the movie grinds to a halt. As Staple tries to wear down their psychic defenses, we sometimes step out of the mental hospital to follow Dunn's son Joseph (Spencer Treat Clark) and Casey Clarke (Anya Taylor-Joy), The Horde's sole surviving victim from Split. While Staple is working to convince her patients they are normal, Joseph and Casey are working separately to convince themselves that something extraordinary is happening. That supermen are real. It's hard to pinpoint exactly where Glass goes off the rails, and that may be because it never really goes off the rails. It just kind of grinds to a halt, the rails themselves corroded by repetition that should have been removed from the script before shooting ever began. At a certain point, I realized I was just … bored. Which is odd, because neither Unbreakable nor Split ever bored, even though they weren't particularly action-oriented; they're essentially dramas with a tinge of thriller. But Glass fails where the other two succeeded, and I'm not entirely sure why. As I said, there's something intriguing about the idea of the film, which does not truly reveal itself until the patented Shyamalan twist: Staple, we learn in the closing moments, is working with some sort of ancient secret society that is aware of the presence of metahumans and dedicated to wiping them out in order to both maintain the balance and also protect the normies from the knowledge that gods walk amongst them. Her efforts to convince the extraordinary that they are ordinary—to drag everyone down to the same level of averageness—has a pleasingly Randian feel to it. And the evil of depriving extraordinary people a sense of meaning and purpose in order to keep the masses calm calls to mind indifferent, impersonal, bureaucratic wickedness that's more real than men who can bend steel or climb walls. But it's either not teased out enough or it's teased out too much or it's buried in side plots. Something about Glass is just … off. Unbalanced. Perhaps it will wear better with repeat viewings. Working up the desire for a repeat viewing, however, will require a superhuman act all its own.